Real estate crowdfunding is quickly becoming the new alternative asset class of choice for investors. I’ve shared my experience investing on RealtyShares and PeerStreet here on the blog but wanted to get another investor’s perspective on a different website. The VP of Communications, Soren Godbersen, at EquityMultiple reached out after he read a few of my real estate investing articles. I was immediately interested in the company’s institutional-level investments and as the only online investment platform backed by an established real estate firm. For another perspective, I reached out to another long-time real estate crowdfunding investor. Steve is a Portfolio Manager at a Los Angeles-based investment firm for commercial real estate investors. He agreed to an interview about his experience with real estate crowdfunding and the EquityMultiple platform. The interview revealed a lot of great information on how to invest in crowdfunding real estate, so much so that I considered making this a series instead of just one long article. You might not be able to finish the whole article at once so bookmark it and come back if you need to because there are some gold nuggets here to really get you started right in real estate crowdfunding. What got you interested in real estate crowdfunding? Steve: I have been in the commercial real estate business for over 20 years and have always had an affinity for the space. My firm is an institutional investment advisor and as a public company we are closely regulated on what types of individual investments we can make. The real estate crowdfunding platform is allowed and thus gives me access to the private investment market. I like that you can review and essentially underwrite each deal to see how it fits into your portfolio. Joseph: What really struck me interviewing Steve is the fact that he works in traditional commercial real estate investment and has chosen to get into crowdfunding as well. Here’s a guy with all the access to traditional real estate investment you could hope for and he’s active in real estate crowdfunding. If that’s not a vote of confidence for investing in crowdfunded real estate, I don’t know what is. My own real estate background started in college with a part-time position as a commercial real estate analyst for CB Richard Ellis. Real estate is like no other investment and I love the combination of developing a physical asset and solid cash flows. I’ve been investing directly in properties since my mid-20s but have always run up against the biggest hurdle in real estate investing, diversification. It’s all but impossible for individual investors to diversify a portfolio of properties with less than a million. That means buying different property types in different regions. Buy less than a dozen or more properties across the U.S. and you expose yourself to regional crashes and weakness in a particular type of property. That’s where real estate crowdfunding comes in. For just a few thousand on each deal, you can diversify your traditional investment portfolio with properties all over the country. Even better, each property is professionally-managed so the investment doesn’t add to your workload. Have you invested in traditional real estate or REITs? Steve: Yes, I have been involved in direct ownership of real estate and have owned a number of publicly traded REITs over the years. Joseph: I think a lot of investors look at the different types of real estate investing as an either-or situation. They figure they own a few shares of real estate investment trusts (REITs) so why would they need to own property directly or through real estate crowdfunding. Each method of real estate investing carries its own advantages and limitations, making the best portfolio one that incorporates them all. Direct Property Investment: Offers the highest return if you can develop and manage your own property but can be a huge burden for individual investors. Direct ownership also offers a great tax deduction against other income. The problem with buying property directly is a double-whammy. It can cost millions to buy enough individual properties to diversify away your risks. Even if you’re able to do that, managing all those properties yourself is a full-time job. REIT Investment: REITs are special companies that own and manage commercial real estate, usually in a specific property type. They trade just like stocks so are easy to buy and you get professional management. The companies avoid corporate income taxes if they pay out most of their income to investors, meaning these real estate investments provide consistent cash flow. The problem with REITs is the cost structure. You pay for that professional management through operating costs of the company plus you pay an annual fee on the shares. REITs are also exposed to stock market risks so they don’t offer exactly the same protections as the other two ways to invest in real estate. Real Estate Crowdfunding Investment: Is like a hybrid model between the other two ways to invest in real estate investing. You get direct ownership in properties and that diversification but also the property management by a professional developer. There are two problems with real estate crowdfunding, as I see it. While the crowdfunding platforms do their own analysis to check developers and properties, you still need to do some of your own analysis. Starting a real estate investing group to share in the analysis work is a great idea for new investors. Also, most of the deals tend to be on short-term projects of five years or less. That means you’ll need to look for investments more often than you would a longer-term investment in a property or a REIT. Any real estate investment is going to offer protection against runaway inflation, solid long-term returns and diversification of your risks from a stock/bond portfolio. The amount of your wealth you hold in real estate might vary by age and your own investing needs but everyone should have some property in their portfolio. No other investment has created as much family wealth as real estate. That should tell you something. 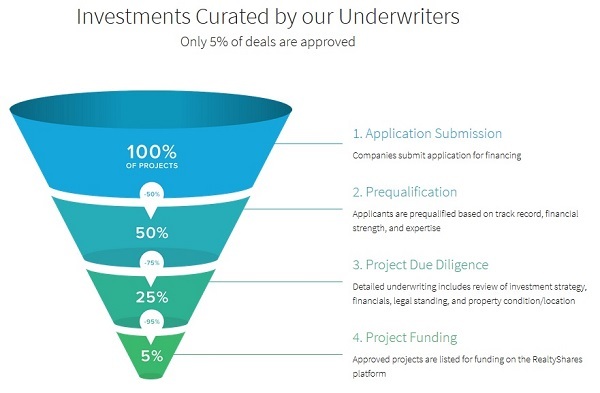 In how many real estate crowdfunding deals have you participated? Steve: I have participated in 14 deals over the past two years. Joseph: One of the benefits to real estate crowdfunding is the ability to get access to deals all across the country and in different property types for a fraction of the cost compared to traditional property investing. That means building your portfolio to ten or more deals. Just as with investing in stocks of companies in different sectors, investing in different property types will help protect you against economic events. Some property types are exposed to rising interest rates while others are relatively immune. Some property types follow the business cycle, as with office rents, while others have more constant demand. Since most real estate crowdfunding sites only get a few new deals a month, it’s easier to build a solid portfolio if you’re investing on more than one site. That’s why I invest on multiple platforms, to get access to the best deals and build a portfolio faster. How much do you invest in each crowdfunding deal, on average? Steve: One of the attractive things of crowdfunding vehicles is the relatively small investment increments that are allowed. I typically invest $20,000-40,000 in each deal but that will obviously vary for each investor. Joseph: The minimum investment per property will vary from platform to platform. I’ve found that deals on RealtyShares generally require an investment from $1,000 to $5,000 while those on PeerStreet is $1,000 per loan. The larger, institutional-level deals on EquityMultiple usually means minimums are higher, between $5,000 and $10,000 per deal. That’s still a fraction of what it would cost you to develop your own real estate project. With real estate crowdfunding, an individual investor can easily put together a diversified portfolio for less than $20,000 in equity and debt investments. Are you investing on other real estate crowdfunding sites besides EquityMultiple? Steve: No, I have only used EquityMultiple to this point. I have reviewed other crowdfunding websites and spent a lot of time looking into the operations and understanding the principals behind the business. I feel that EM is a very strong vehicle and have been pleased with the deal flow and quality of real estate deals I have had access to thus far. Joseph: I first heard about real estate crowdfunding through RealtyShares and have been following the idea since 2014. Since then, I have opened accounts on three other platforms. I’m still building my portfolio but like investing on different sites because you get access to more deals and unique crowdfunding models. RealtyShares: Offers both residential and commercial property deals for equity and debt investments. The site has been aggressive at adding investors and developers so has one of the best deal flows I’ve seen. Minimum investments tend to be lower, from $1,000 to $5,000 per project. Editor's Update – I've negotiated a special, limited-time offer with RealtyShares. Click on the link below and use promo code: Partner100 to get a bonus $100 on your first investment! PeerStreet: Only offers real estate debt investments but has a solid deal flow and low minimum investment of $1,000 per loan. The site has the only automated investment feature I’ve seen that will automatically put your excess cash to work on loans that fit your criteria. A great platform to diversify your portfolio of equity real estate investments with debt secured by properties. EquityMultiple: Offers institutional-size commercial real estate deals. That means larger projects and professional development firms with decades of experience. Senior debt investments target 8% to 12% net annual returns while equity investments tend to target 13% and higher rates of return. RealtyMogul: Offers debt and equity real estate deals but structures the investments differently compared to other platforms. Instead of investing directly in the properties, you are investing in an LLC set up and owned by RealtyMogul. I haven’t heard any complaints about this type of investment structure but would generally rather invest directly in the properties myself. Patch of Land: Specializes in short-term real estate debt from 30-days to 36-months. All deals on the platform are pre-funded by the company’s backers and then segmented and sold to investors. What are three things you look for in the best real estate crowdfunding deals? Steve: I would say the three primary things that I review very closely in each deal are the property, market conditions and business plan feasibility of the sponsor. I want to make sure that the sponsor's business plan makes sense given the property and market they are targeting, so I look carefully at the underlying projections to see if they make sense versus other alternatives in the marketplace. In all these factors, I look at the scenarios that are provided by EquityMultiple, and usually overlay my own set of projections to see what the range of outcomes looks like. Joseph: I could write a book on real estate analysis so it’s tough to pinpoint just a few things real estate crowdfunding investors should look for in a deal. It’s one of the limitations of the investment, the work that needs to go in to analyzing your potential deals. All the crowdfunding platforms have their own staff that investigate the developer (sponsor), the property and the numbers behind the deal. RealtyShares reports that just 5% of the deals submitted to its site end up making it in front of investors. That said, you still need to do a little homework yourself to make sure an investment looks good and fits with your portfolio. How much experience does the developer have and have they managed this kind of a project before? Do I need this type of property or regional exposure in my portfolio or am I already diversified in the area? Who else is financing the project and what are their rights to the property? Are there any zoning issues that still need resolved or does the developer have a greenlight? How does the potential return for the project stack up against other similar projects? Is the timeline for the project realistic compared to other deals? What are the biggest assumptions on which the developer is relying to meet projections? Compare these assumptions like property value, rent increases, vacancy rates against averages in the local market. Analyzing your own real estate crowdfunding deals can be a little overwhelming at first but can also be a lot of fun. The platforms do a good job of vetting deals and laying out the risks so that’s useful when you’re first starting. It also helps to diversify across as many deals as possible so one property won’t break your portfolio if the return turns out to be less than expected. Are there any warning signs new real estate crowdfunding investors should watch for in a bad deal? Steve: It is really hard to define a “bad” deal per se, as much of the investment decision comes down to the individual investor's risk tolerance and goals for an investment. That said, I think there are certainly some red flags that can emerge that new crowdfunding investors should be wary of. Look carefully at the business plan and see if the projected cash flow and exit strategies make sense. Are there comparable lease and property sales to support the assumptions? I am always wary of deals that are fully dependent upon a future sale as the driver of returns, unless the returns are very high and the assumptions are sound. Another red flag is if a sponsor has very little experience or is branching out into a market or property type that they don't have a stable track record. Joseph: Steve’s point about deal returns contingent on a future sale is an important one. I also like to see that the property can yield a solid return on the basis of rents rather than on a high sales price. Most real estate crowdfunding deals are short-term developments or flips. The project return will usually be dependent on the sales price but that doesn’t mean there is no potential return from rents. I like to see deals where the developer has the option to provide a good rent return if sales prices fall apart and they have to hold onto the property for a while longer. Have you recorded any returns yet on any crowdfunding deals? Steve: I have had one deal that was a 9-month bridge loan that fully paid off as expected with a 9%+ annualized yield. My portfolio is a mixture of mostly equity holdings that are a combination of solid current returns or are development plays that have a higher expected return once completed. About 75% of my portfolio is providing solid ongoing cash returns, and the remaining 25% is slated for a more speculative IRR. Joseph: The real estate crowdfunding sites are hesitant to talk about returns for regulatory concerns, not wanting to seem like they are being promotional. With real estate crowdfunding being as new as it is, it’s tough to forecast returns over the long-run. Real estate crowdfunding returns should be at least comparable to the return on equity REITs, maybe even higher. That would mean annual returns to property investors of around 15% over the long-term. 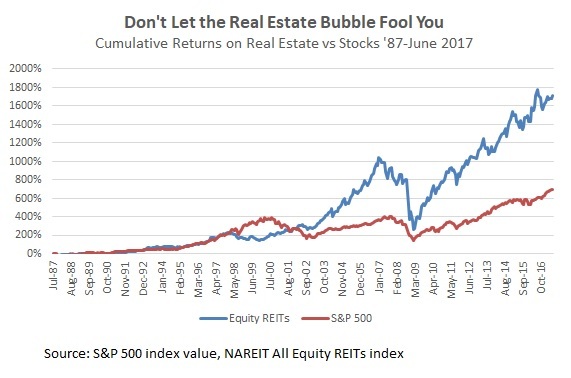 Even accounting for the biggest real estate bust in U.S. history, equity investment in real estate still easily beat the return on stocks in the 20 years through 2016. Large equity REIT companies don’t have the flexibility or speed that smaller crowdfunding developers have so I wouldn’t be surprised if real estate crowdfunding investors see returns a percent or two higher than REITs on an annualized basis. Real estate crowdfunding returns will vary by type of investment as well. PeerStreet, which specializes in debt investments, quotes historical returns between 6% and 12% annually. Double-digit returns on safe debt investments is unheard of in traditional bond investing unless you’re buying the bonds of bankrupt countries like Venezuela. Returns on equity crowdfunding will be higher but with more risk. Deals generally quote projected returns from 9% to 15% on most platforms which means you’re probably looking at a blended return of 10% to 12% after accounting for deals that don’t meet expectations. Even a return of 9% annually on real estate crowdfunding would be excellent considering you’re also getting a diversifier from other assets in your portfolio. This is a point too often neglected when investors look at the different asset classes. Even traditional bonds with meager annual returns of 5% are a critical addition for their ability to reduce your risk from the roller-coaster stock market. How do you judge whether the developer has the necessary skills to be successful? Steve: As noted above, I generally take a look at their history. Even if they are relatively new to the real estate development arena, most of the sponsors that I have reviewed have a fairly strong real estate investment background. I often look at the websites, reviews of currently owned properties or even call people I know in the industry to see if they have good references. Joseph: The platforms do a good job at vetting deal sponsors but it’s always good to do your own homework as well. There are enough crowdfunding deals available that you don’t need to invest with a questionable developer just to put your money to work. In real estate crowdfunding, as with any investment, it’s better to let a few diamonds go by than to invest in every opportunity and get stuck with a lump of coal. I start by checking the public profiles of the development team, especially LinkedIn, to make sure they match with what is said on the crowdfunding platform. You’d be amazed at what you can find with a simple Google search. You can also check with the county assessor to make sure the property is registered to the sponsor or development team. How do you estimate the potential return on real estate crowdfunding deals? Steve: EquityMultiple does a very good job of providing projected returns and the background cash flows that are used in the assumptions. I look at the projections and then try to overlay my own assumptions on them. EM also provides a range of outcomes including optimistic and pessimistic that gives an investor a feel for the range of likely outcomes. I can't say that I have a specific cut-off return for a go/no-go decision. That return threshold will depend on the underlying risk of the transaction. I generally try to build my portfolio with a mixture of stable properties that have durable current income streams and then blend in some higher-risk transactions that can provide a much higher return. Each investor has to determine what other alternative investments are available and then assess how each real estate investment fits into their objectives. Joseph: All the real estate crowdfunding sites have analysts that check projections on projects to give investors an idea of projected returns. Doing some additional analysis and with a little experience, you’ll quickly get an idea of how to adjust projected returns higher or lower on your own assumptions. Just as you need to diversify your overall wealth in different assets by investing in stocks, bonds and real estate, you should also diversify within each asset. You do this in your real estate portfolio by investing across property types, regions and types of deals. Steve shares a great idea here to build a base of investments with solid income and then add some higher-risk, higher-return deals as they come along. What else should new real estate crowdfunding investors know to be successful? Steve: I would say that to be successful in real estate crowdfunding, and investor should have some defined objectives that they are trying to meet in this space. Real estate can provide a number of attractive opportunities such as diversification, current income and possible inflation hedging, but not all deals are created equal. Investors should be prepared to “dig in” to each deal and understand that this is an illiquid investment that you just can't sell out of on a whim. Given that your eventual performance is many factors are outside of your control, you should enter each deal with your eyes wide open. I really enjoy diving into the analysis and studying the business plan closely. Though it can be challenging, it is often quite rewarding and a lot of fun! Joseph: Steve makes another great point about real estate crowdfunding being an ‘illiquid’ investment. That means you can’t just sell your investment like you can in stocks. Judging from investors’ tendency to panic-selling in the stock market, it might actually be a good thing that you’re locked into the investment for a few years. Most real estate crowdfunding deals are termed from one to five years so it’s not like you are locked into the property for decades anyway. There were a lot of great ideas for real estate crowdfunding investors and I want to highlight a few as a summary. Real estate crowdfunding is a great way to diversify your other real estate investments in property and REITs. Invest in multiple deals on multiple platforms to get access to as many opportunities as possible and reduce your risk around any one deal. Do your homework on each deal, checking projections for the property, market conditions and on the developer. Look for properties that can provide a solid real estate income return besides the potential on a quick sale at a higher price. Real estate crowdfunding returns of 10% and higher are just part of the story along with a chance to diversify your risks in stocks and bonds. Understand that real estate crowdfunding is an illiquid investment and you’ll have to hold properties for the duration of the project. 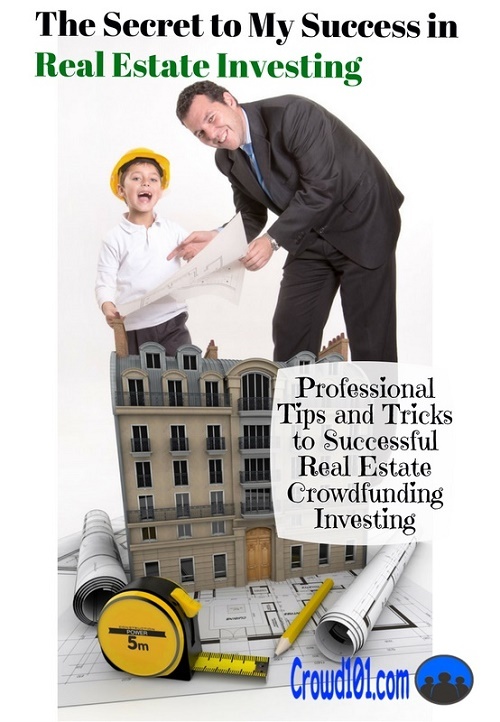 I want to thank Steve for his insight and tips for real estate crowdfunding investors. The interview revealed a lot of great information around real estate crowdfunding returns, how to find the best crowdfunding deals and how to invest on the different websites. I’d love to hear your story as a real estate crowdfunding investor or your experience investing in properties.